On this National Parks tour, we have included some out-of-the-ordinary experiences. Visit Tatanka to learn “The Story of the Bison” and to learn about the Lakota people. We have also arranged a chuckwagon cookout and Wild West show in Jackson. All of this and more—including time in Jackson—await you on this marvelous vacation through some of the West’s national parks. After an orientation tour of Rapid City, visit CRAZY HORSE MEMORIAL, built in honor of the fearless Sioux Indian chief whose fame is derived from the Battle of the Little Bighorn. 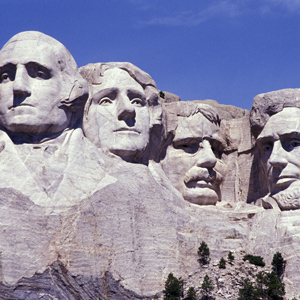 Afterward, explore MOUNT RUSHMORE NATIONAL MEMORIAL, which features the monumental likenesses of four U.S. presidents-Washington, Jefferson, Lincoln, and Theodore Roosevelt—carved on the face of a mountain. Maybe stroll along the Presidential Trail for more intimate views, or visit the Information Center. SPECIAL FEATURE: Enjoy a 2-night stay inside Yellowstone National Park. Each lodge has its own unique setting and atmosphere. Lodges featured are the Old Faithful Inn, Lake Yellowstone Hotel, Old Faithful Snow Lodge, Grant Village, and the Mammoth Hot Springs Hotel. Specific lodges will be confirmed in your documents. Spend the day exploring Yellowstone. Travel along Grand Loop Road to Fountain Paint Pots to see the bubbling mud. Continue on to the Grand Canyon of Yellowstone for magnificent views of Yellowstone Canyon and the spectacular Lower Falls—almost twice as high as Niagara Falls! Next, stop at Mammoth Hot Springs and take a short trail walk through steaming limestone terraces. Journey south this morning into breathtaking GRAND TETON NATIONAL PARK. Visit beautiful glacier-fed Jenny Lake at the foot of the rugged spires for a delightful walk along the shore before arriving in the all-Western town of Jackson. This evening, travel by horse-drawn covered wagon into Cache Creek Canyon and experience dinner at the BAR T-5 CHUCKWAGON COOKOUT and Wild West show. Feast on slow-cooked chicken made in traditional Dutch ovens, along with other local specialties. Full day at leisure to enjoy this spectacular playground. Perhaps choose an optional float trip along the Snake River or stroll along the downtown boardwalks and enjoy a drink at one of the swing-door saloons. Today’s journey continues alongside some of Wyoming’s most beautiful mountain ranges into Utah, home to five national parks. Arrive in Salt Lake City, founded by Brigham Young in 1847. Enjoy a sightseeing tour of the capital city and its historic monuments. This evening, your Tour Director hosts a special farewell dinner at Temple Square. Your tour ends this morning with guests departing on independent schedules. Transfers are provided to Salt Lake City International Airport. Enjoy the spectacular fall colors of the West on our special Fall Foliage departures: September 10-September 25 (if Mother Nature permits). The Adoba Hotel Rapid City is a great place to rest after spending a busy day in Rapid City exploring everything the city offers. The Adoba is an eco-friendly hotel representing sustainability in South Dakota. The rooms have a fun decor showcasing the beauty and flavor of South Dakota. 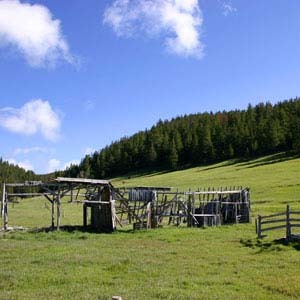 The hotel is located at the base of the astonishing Big Horn Mountain Range in historic downtown Sheridan. It is convenient to many local area attractions as well as shopping and dining. The hotel has a restaurant, lounge, indoor pool, hot tub, guest laundry, business center, and high-speed Internet access. Located downtown, the Holiday Inn Cody is minutes away from local shops, restaurants, and attractions. Amenities at the hotel include an outdoor pool, a fitness center, a gift shop, and 189 guestrooms. Each Yellowstone National Park Lodge, like the one shown here, has its own unique setting and atmosphere. The specific lodge for your vacation will be confirmed with vacation documents, which are sent approximately 30 days prior to departure. Lodges featured in Yellowstone National Park are the Old Faithful Inn, Lake Yellowstone Hotel, Mammoth Hot Springs Hotel, Grant Village, and Old Faithful Snow Lodge. On the historic site of Fort Yellowstone, this traditional hotel is nestled in the trees alongside the mountains. The features of this hotel include high ceilings, pine wood accents, and 211 cozy guestrooms. Mammoth Hot Springs Hotel is part of a collection of lodges operated by the National Parks; space fills up quickly at these lodges and is therefore based on availability. In the event that space is not available at this hotel, an alternate lodge of simliliar category will be secured. The Rustic Inn Creekside Resort & Spa welcomes guests with warm Western hospitality. Outdoor enthusiasts and hedonists alike indulge in the lavishly appointed historic lodging accomodations and luxury log cabins. The Radisson is located in downtown Salt Lake City near ample shopping, dining, and attractions. The hotel has concierge service, indoor pool, hot tub, fitness center, guest laundry, gift shop, business center, restaurant, lounge, and room service.